The Chilean people celebrate Independence Day, one of the national holidays, on September 18. Celebration of this holiday opens a series of festive events, that are awaited by children and adults, because many schools and companies have a week-long holiday. The Spanish began conquering Chile in 1540 in hope to find rich gold and silver mines. Although they didn't find what they wanted, they recognized the agricultural potential of the country. Spain administered Chile as one of its colony till the early 1800s, when the movement of independence began to spread across the colonies of Central and South America. In Chile the movement was also forced by the appointment of an unpopular governor in 1808. On September 18, 1810 the First Government Junta was established in Chile to administer the country after deposition and imprisonment of King Ferdinand VII by Napoleon Bonaparte. This was one of the first steps of Chile towards its independence and the event, that led to the beginning of the Chilean War of Independence. 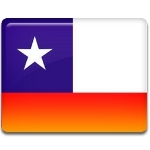 Officially Chile declared independence from Spain only on February 12, 1818 and it was recognized on April 25, 1844. But the establishment of the First Government Junta and beginning of the war of independence are traditionally celebrated in Chile as Independence Day. Celebration of Independence Day is marked with national parties, that include parades, dancing, partying and displays of national pride. A firework illuminates the sky in the evening.